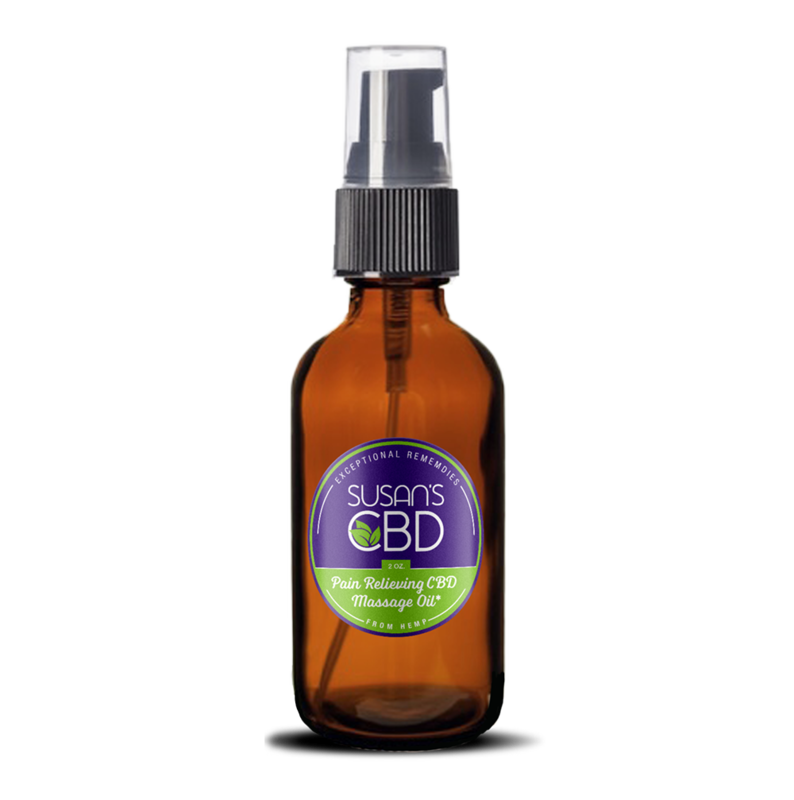 Our soothing all natural massage oil contains 1,200 milligrams of hemp CBD per bottle providing effective relief for sore muscles. One of our most popular products, now in a larger size. 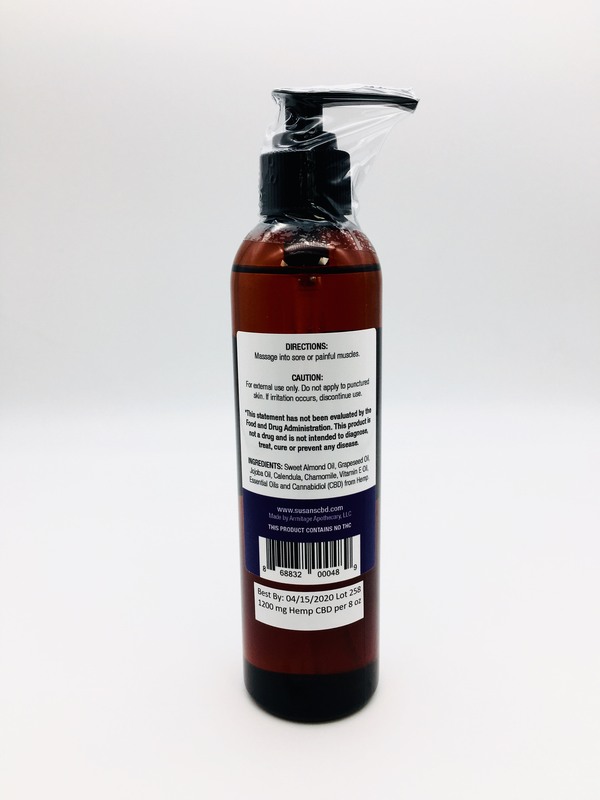 Professional lab tests indicate this 8 oz massage oil contains over 1,200 milligrams of hemp CBD from isolate, offering excellent relief for sore muscles, aches and pains. View lab test results. 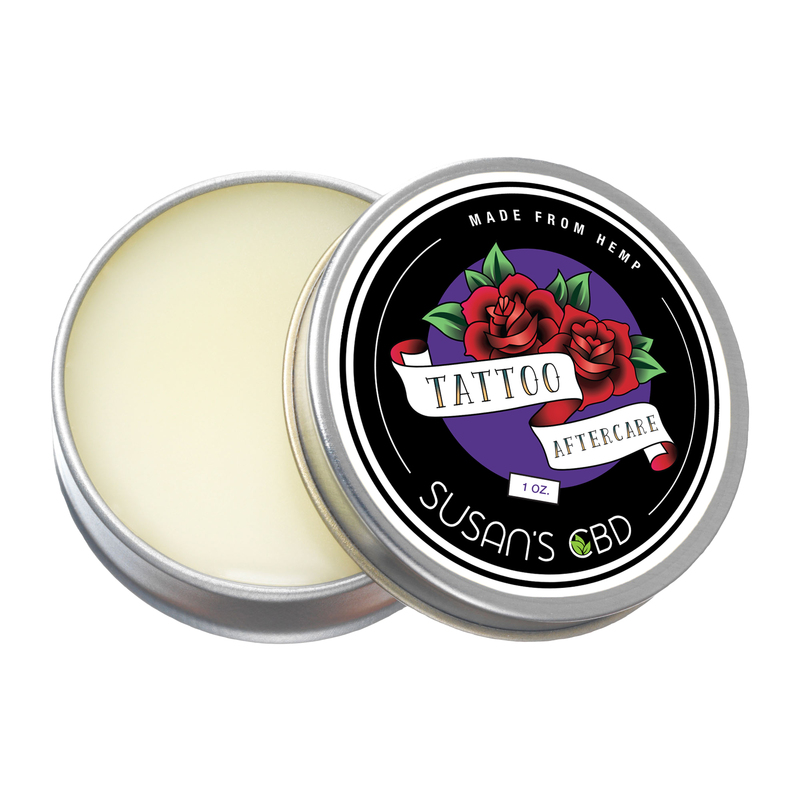 For the professional massage therapist or treat yourself, this all natural products contains sweet almond oil infused with calming calendula, grapeseed oil infused with chamomile, Vitamin E, jojoba oil, essential oils and an effective dose of hemp derived CBD. Try it in combination with our Natural Pain Relief Salve – massage first, then apply the pain salve and enjoy the benefits. 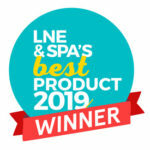 This product was voted “Best Massage Product for 2019” by readers of LNE & Spa Magazine. Try it today! 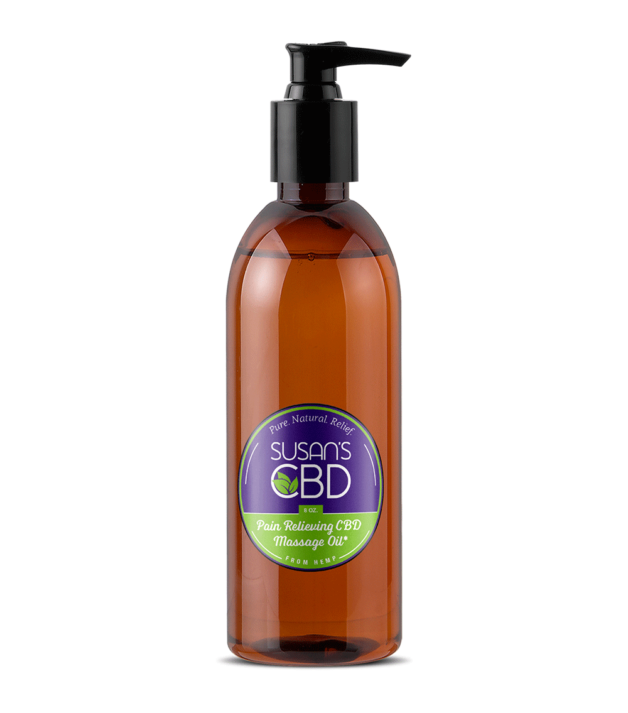 Ingredients: Sweet Almond Oil, Grapeseed Oil, Vitamin E, Jojoba Oil, Calendula, Chamomile, Essential Oils of Lavender, Rosemary, Bergamot and Hemp Cannabidiol (CBD) isolate. This product is vegan. We never test on animals. We do offer a version of our Massage Oil without essential oils or tree nut oil upon special request. Send us an email to order. I have been using the massage oil with fantastic feedback and results. This is my very favorite product and I am obsessed with it! I use it personally as well as on all of my massage clients. They LOVE it, too! I can’t keep it in stock! I look forward to giving out the small bottles as Christmas gifts this year, too! 🙂 <3 Thank you!! This CBD oil is amazing and our massage clients love it! 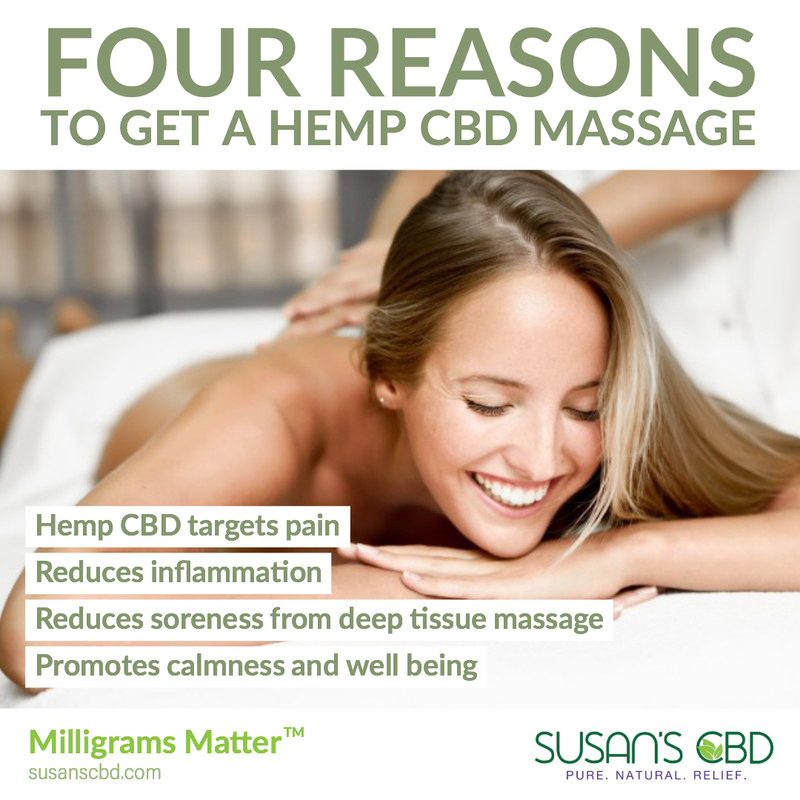 It’s 3x more potent compared to the oil many other spas are using and you really can feel the results. Highly recommended!! I have been using this oil for a few months now, and this is the best I’ve tried. It is great for neuropathic pain and aching muscles. My daughter and I are sharing the 8oz bottle of massage oil. Our therapist says it’s wonderful from her view point while my daughter and I get a lot of relief from it. I just sent for the salve but in the meantime I am using the oil to rub on one particular area that is causing me grief and it is keeping it under control. I am pleased with products and service from this site and am happy to be a customer. Highly recommended using this in your massage practice and also for yourself! Amazing glide, smells great, and clients are LOVING it! Wholesale available, please contact us for pricing. Need a special formulation or special order? Contact us, we can make it for you. Disclaimer: * These statements have not been evaluated by the Food and Drug Administration. This product is not intended to diagnose, treat, cure or prevent any disease.